I met Justin Witt in Kamchatka, Russia, last year, where he was the head fly fishing guide for a wilderness adventure that my son Matt and I went on. I recently caught up with Justin again, and he was delighted to participate in an interview. He is the owner of Patagonia Unlimited, an outfitting company that offers fly fishing and other outdoor activities in Patagonia, as well as many other destinations about the world. He is a true adventurer, and knows no bounds in the search for fly fishing thrills. Justin, how did you get started fly fishing? I’ve fished as long as I can remember. Longer, really, since there are photos of me in the family albums at age three holding trout that are half as long as I was back then, and smiling like the world was my oyster. My father was a fly fisherman, as well as all my uncles, and my grandfather had taught them. I’m not sure how far back the addiction runs in our family tree. But as a kid, I had a rod tube strapped to the top bar of my bicycle at all times and the range of my explorations just gradually pushed farther and farther out from the house as years went by, until I was sixteen, and then it suddenly took the quantum leap from bicycle range to vehicle range. My formal studies suffered I suppose as a result, but by the time I was twenty, I had fished my way across most of the continental United States and a good bit of Canada. Then, after college, I started my first company, and in retrospect, I can see that being self employed all these years probably was not a coincidence. This allowed me to work only as much as I needed to in between fishing trips, which soon enough began to start and end on planes as often as they did behind the wheel, until eventually I ended up on a long, lonely walk from Cape Horn north, skipping back and forth across the Andes through the whole of Patagonia, where I later settled and founded the outfitting company that I still run today. 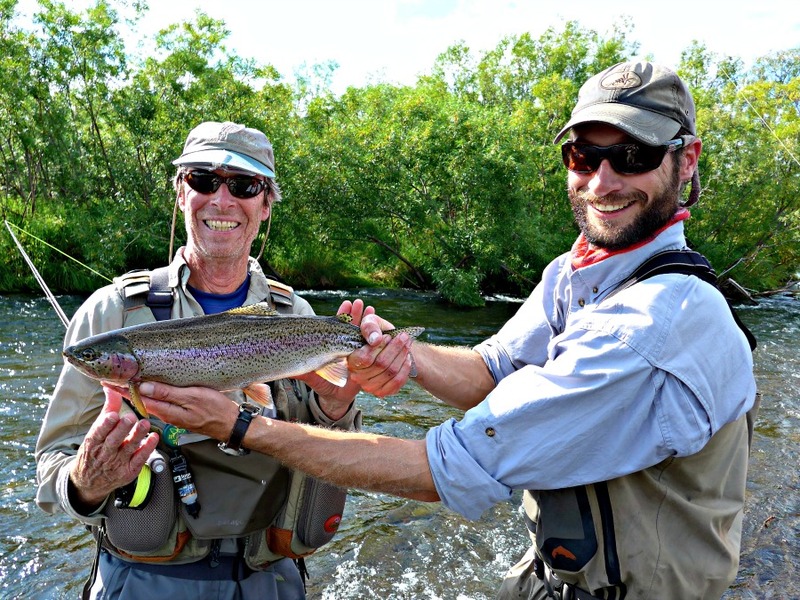 How did you transition to become a professional fly fisher/outfitter? The transition I made from fishing only as an escape from work into becoming a professional was pretty natural I guess. Once I had seen pretty much the whole of Patagonia and determined that I wanted to live there, I chose the little border town of Rio Pico, based more or less entirely on the fishing. Rio Pico is about as out there as it gets, while still being reasonably accessible. The majority of its residents still make their way around the country on horseback, and the diverse range of rivers, lakes, and spring creeks that surround the tiny town host an amazing diversity of fishing opportunities. I had spent a couple of months of my initial trip walking around there and barely saw another rod; so, knowing that there was still a lot more exploring left to do, I went back and just moved in. There aren’t a lot of work opportunities in that area outside of cattle ranching though, so guiding was an obvious solution. You have traveled the world fly fishing; do you have a favorite place or country to fish? You know, I really don’t. Fly fishing, for me, is a constantly moving and changing pursuit, and all about continued exploration. Last year I guided in Argentina, the Bahamas, Kamchatka Russia, and the Himalayan region of India, while also fishing just for pleasure in the Peruvian Amazon, Alaska, Georgia, and the Rocky Mountains of Colorado. If there was ever going to be a year to be able to isolate preferences, that would have been it. But in the end, I just sort of always move on to explore new countries and species. I have my old favorite haunts for sure, and still enjoy catching six inch brookies in the small streams of Appalachia with a three weight, just like I enjoy fishing for ten pound brookies with ten inch long streamers and a nine wight in the mountains around Rio Pico. And as a guide, I get just as much of a kick out of my clients catching fish that make them happy as I get when I catch those same fish myself, whether they be tarpon or taimen, or anything in between. Do you have a favorite type of fishing? or technique? When I’m out on my own or doing some exploration with my best buddy, Tweed, the truth of the matter is that we are almost always fishing heavy gear. People used to think that we were nuts when we showed up with 350 grain sink-tips and articulated streamers on water that they had been fishing for years with midge emergers, but the truth is, all fish are born with a sort of built-in biological equation that they use to select what they eat: energy expended vs. energy gained. And so down beneath the fourteen inchers that are sipping the emergers from the current seam, often enough there is a thirty inch brown who prefers sushi. The same thing happens on the bonefish flats, with my clients wanting to fish to five pounders in a foot and a half of water, while on my days off I am throwing clear, intermediate lines and heavy crab patterns at fish twice that size who are ten times harder to spot as they cruise water so deep it makes poling a difficult prospect. But really, just like with locations, I’m generally up for anything, including bluegills on the pond out back at Mom’s. Do you have a favorite fish species to target? I wouldn’t call it a favorite really, but at the moment my focus is on grass carp. These fish have been largely ignored by the angling community here in the states ever since the government began stocking them in the late 1800’s as an intended food source for western settlers. And only recently has the American fly fishing community discovered that they are some of the strongest pulling, most selective and challenging fish in our waters. And while the common carp is a neat fish, in my humble opinion, grass carp (Ctenopharyngodon idella) are kings. Pound for pound they are the strongest and most difficult to catch fish I have ever fished for, and they grow to immense sizes. My personal biggest so far is just over fifty inches, and while I didn’t weigh that fish, I would guess he weighed somewhere in the neighborhood of fifty pounds. Have you found a favorite fly for grass carp? That’s a tough one! I’ve caught them on everything from nymphs to poppers that they probably thought were seeds of some sort, but I think my favorite is the persimmon fly, a pattern of my own invention. Persimmons are a kind of fruit native to certain areas of the United States, and where they grow near water, grass carp are eager to respond when one of them falls from the tree and into the water. The trick is to make the fly heavy enough that it creates an audible “plop” when it hits, but still light enough that it can be cast, even on a fairly thin tippet. Grass carp are serious about inspecting what they eat before they eat it, and to date I have never hooked one on anything heavier than 4x, which also means that I have broken an awful lot of them off as they ran me down to the last few yards of backing and I had to apply more pressure than such light line will take. Do you have any general advice for fly fishers? The neat thing about fly fishing is that you will never be done learning. Even if you don’t travel, and focus your efforts on only a single species, the number of variables is always too high to ever reach a point at which you truly feel you are done with the thing because you’ve learned all there is to learn. I once fished a single small stream in the Appalachian range every single day for an entire calendar year. By the end of it, I knew each riffle and current seam, every log, pool and run on the twenty or so mile stretch of it that I fished like the back of my hand. But at the end, I was still learning something every single time I went out. And so for me, that is the essence of what we are doing out there on the water, and I say keep it up. Do have any advice for those considering becoming professionals? Think twice! It isn’t for everyone, and a passion for the sport is not enough to ensure a lucrative or enjoyable career. First off, there’s not all that much money to be made. Obviously, these days the majority of my friends are fly fishing guides, but I don’t know a single one that makes more than forty or fifty thousand dollars a year, even guiding at top locations and two hundred fifty or so days a year. And secondly, there is a huge difference between guiding and fishing. Yes, you are out on the water a lot. And yes, that is better (for most of us) than sitting behind a desk. But what most people who have never done it don’t realize is that there is a lot more to the job than simply rowing the boat and netting fish all day. Much of the year we work an average of fourteen hours a day; ten or so on the water and the rest driving, cleaning and maintaining equipment, or depending on the program and location, even setting up camps and preparing meals for clients. It is hard work, all told, and while many of us who do it wouldn’t dream of doing anything else, there are also an awful lot who get into it and then realize after a season or two that it isn’t what they thought it would be, and isn’t for them. Do you have any advice for potential clients in order to make the most of their experience with a guide? All guides are different, and all clients are different, but for me, the most important thing is to be up front, and have realistic communication. I tend to ask a lot of questions at the outset, and get a feel for what a client’s expectations are, then act according to those. Some folks want to learn as much as possible, and others just want to relax and have a good time. Others want to fish their way, and think of the guide more as just an oarsman than a teacher. All of this is fine, but it is important to get the relationship into its proper groove early on in order to avoid a potential clash of energies later on. Do you have any concerns about the future of fly fishing? My biggest concern is with conservation. I’ve fished in some of the most out of the way places on Earth over the course of my career, and there hasn’t been a single one of them yet that wasn’t better fifty years ago than it is today. Whether it’s mining, dam building, low water due to diversions for cities and irrigation, pollution, or simply over-fishing, almost every river and lake on Earth, and even our oceans, are suffering from what I would call “over use”, and fly fishing suffers as a result. There are a lot of reasons that mankind needs to start paying attention to this problem, fly fishing conservation being only one, but if we don’t change our ways sometime soon, we’re going to encounter a moment at which it will be too late to reverse the trend. Al- Thanks so much Justin for taking some time “off the water” for this interview. I look forward to seeing you in February, and fishing the waters of Patagonia. For anyone thinking of a similar jaunt, I highly recommend Justin’s company. He can be reached at patagoniaunlimited.net. interview conducted by Al Simpson, and published 9/15. Excellent article Al, and absolutely amazing to read. Justin is obviously a very talented and capable fisherman and guide. He is also clearly an experienced world traveller, and spot-on conservationist, with a message for us all to clearly think about.